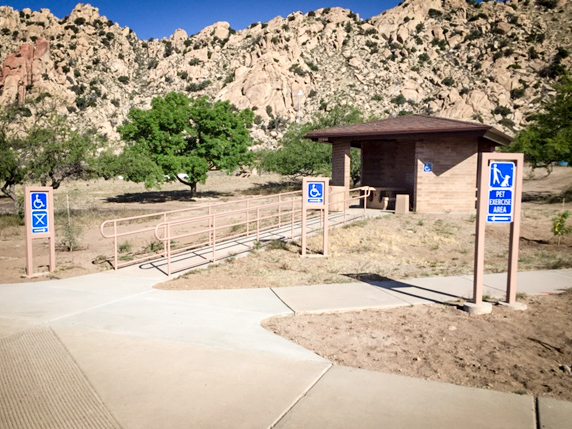 Benson-Stein Pass Highway (Texas Canyon Rest Area) - KE&G Construction, Inc. This project is located in Cochise County along Interstate 10 at milepost 320, approximately 15 miles east of the City of Benson. The work included upgrading equipment in the restrooms, pump house, ramadas, and well site, in addition to sewer system rehabilitation. Construction included installing six new evaporation pond liners, waterline distribution replacement, micro surfacing AC pavement, signing, 3,100 linear feet of pavement markings, placing 90 tons of mineral aggregate and 3 acres of seeding. This project received an APWA SAB award under the 2016 Public Works Project of the Year Structures less than $5 Million category.